It's rare I cook pasta - usually I require some serious persuasion from Joe before I will break and cook the Italian beast. However, after a few months of not being able to eat any carbohydrates without feeling like death, I'm enjoying a period where I can eat what I want. 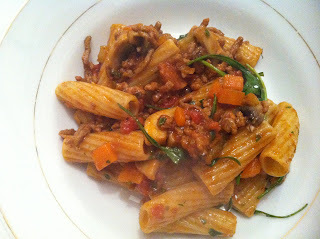 So tonight it was a celebratory meal of ragu with whole wheat penne. My ragu is not so traditional - it is seasoned with chorizo, smoked paprika and cayenne pepper and topped with rocket - but it tastes mighty fine and that's all that matters. And that celebration, you ask? Well, a 6-1 super win over Brighton in the FA cup. We might just make two finals this year..........!